Midazolam, marketed under the trade name Versed, among others, is a medication used for anesthesia, procedural sedation, trouble sleeping, and severe agitation. It works by inducing sleepiness, decreasing anxiety, and causing a loss of ability to create new memories. It is also useful for the treatment of seizures. Midazolam can be given by mouth, intravenously, or injection into a muscle, by spraying into the nose, or through the cheek. When given intravenously, it typically begins working within five minutes; when injected into a muscle, it can take fifteen minutes to begin working. Effects last for between one and six hours. Side effects can include a decrease in efforts to breathe, low blood pressure, and sleepiness. Tolerance to its effects and withdrawal syndrome may occur following long-term use. Paradoxical effects, such as increased activity, can occur especially in children and older people. There is evidence of risk when used during pregnancy but no evidence of harm with a single dose during breastfeeding. It belongs to the benzodiazepine class of drugs and works by increasing the activity of the GABA neurotransmitter in the brain. Midazolam was patented in 1974 and came into medical use in 1982. It is on the World Health Organization’s List of Essential Medicines, the most effective and safe medicines needed in a health system. Midazolam is available as a generic medication and is not very expensive. The wholesale cost in the developing world of a vial is about US$0.35. In many countries, it is a controlled substance. Midazolam is sometimes used for the acute management of seizures. Long-term use for the management of epilepsy is not recommended due to the significant risk of tolerance (which renders midazolam and other benzodiazepines ineffective) and the significant side effect of sedation. A benefit of midazolam is that in children it can be given in the cheek or in the nose for acute seizures, including status epilepticus. Midazolam is effective for status epilepticus that has not improved following other treatments or when intravenous access cannot be obtained, and has advantages of being water-soluble, having a rapid onset of action and not causing metabolic acidosis from the propylene glycol vehicle, which occurs with other benzodiazepines. Drawbacks include a high degree of breakthrough seizures—due to the short half-life of midazolam—in over 50% of people treated, as well as treatment failure in 14–18% of people with refractory status epilepticus. Tolerance develops rapidly to the anticonvulsant effect, and the dose may need to be increased by several times to maintain anticonvulsant therapeutic effects. With prolonged use, tolerance and tachyphylaxis can occur and the elimination half-life may increase, up to days. There is evidence buccal and intranasal midazolam is easier to administer and more effective than rectally administered diazepam in the emergency control of seizures. Intravenous midazolam is indicated for procedural sedation (often in combination with an opioid, such as fentanyl), for preoperative sedation, for the induction of general anesthesia, and for sedation of people who are ventilated in critical care units. Midazolam is superior to diazepam in impairing memory of endoscopy procedures, but propofol has a quicker recovery time and a better memory-impairing effect. It is the most popular benzodiazepine in the intensive care unit (ICU) because of its short elimination half-life, combined with its water solubility and its suitability for continuous infusion. However, for long-term sedation, lorazepam is preferred due to its long duration of action, and propofol has advantages over midazolam when used in the ICU for sedation, such as shorter weaning time and earlier tracheal extubation. Midazolam is sometimes used in neonatal intensive care units. When used, additional caution is required in newborns; midazolam should not be used for longer than 72 hours due to risks of tachyphylaxis, and the possibility of development of a benzodiazepine withdrawal syndrome, as well as neurological complications. Bolus injections should be avoided due to the increased risk of cardiovascular depression, as well as neurological complications. Midazolam is also sometimes used in newborns who are receiving mechanical ventilation, although morphine is preferred, owing to its better safety profile for this indication. Midazolam, in combination with an antipsychotic drug, is indicated for the acute management of schizophrenia when it is associated with aggressive or out-of-control behaviour. In the final stages of end-of-life care, midazolam is routinely used at low doses via subcutaneous injection to help with agitation, myoclonus, restlessness or anxiety in the last hours or days of life. At higher doses during the last weeks of life, midazolam is considered a first line agent in palliative continuous deep sedation therapy when it is necessary to alleviate intolerable suffering not responsive to other treatments, but the need for this is rare. Benzodiazepines require special precaution if used in the elderly, during pregnancy, in children, in alcohol- or other drug-dependent individuals or those with comorbid psychiatric disorders. Additional caution is required in critically ill patients, as accumulation of midazolam and its active metabolites may occur. Kidney or liver impairments may slow down the elimination of midazolam leading to prolonged and enhanced effects. Contraindications include hypersensitivity, acute narrow-angle glaucoma, shock, hypotension, or head injury. Most are relative contraindications. Side effects of midazolam in the elderly are listed above. People experiencing amnesia as a side effect of midazolam are generally unaware their memory is impaired, unless they had previously known it as a side effect. Long-term use of benzodiazepines has been associated with long-lasting deficits of memory, and show only partial recovery six months after stopping benzodiazepines. It is unclear whether full recovery occurs after longer periods of abstinence. Benzodiazepines can cause or worsen depression. Paradoxical excitement occasionally occurs with benzodiazepines, including a worsening of seizures. Children and elderly individuals or those with a history of alcohol abuse and individuals with a history of aggressive behavior or anger are at increased risk of paradoxical effects. Paradoxical reactions are particularly associated with intravenous administration. After nighttime administration of midazolam, residual ‘hangover’ effects, such as sleepiness and impaired psychomotor and cognitive functions, may persist into the next day. This may impair the ability of users to drive safely and may increase the risk of falls and hip fractures. Sedation, respiratory depression and hypotension due to a reduction in systematic vascular resistance, and an increase in heart rate can occur. If intravenous midazolam is given too quickly, hypotension may occur. A “midazolam infusion syndrome” may result from high doses, and is characterised by delayed arousal hours to days after discontinuation of midazolam, and may lead to an increase in the length of ventilatory support needed. In susceptible individuals, midazolam has been known to cause a paradoxical reaction, a well-documented complication with benzodiazepines. When this occurs, the individual may experience anxiety, involuntary movements, aggressive or violent behavior, uncontrollable crying or verbalization, and other similar effects. This seems to be related to the altered state of consciousness or disinhibition produced by the drug. Paradoxical behavior is often not recalled by the patient due to the amnesia-producing properties of the drug. In extreme situations, flumazenil can be administered to inhibit or reverse the effects of midazolam. Antipsychotic medications, such as haloperidol, have also been used for this purpose. Midazolam is known to cause respiratory depression. In healthy humans, 0.15 mg/kg of midazolam may cause respiratory depression, which is postulated to be a central nervous system (CNS) effect. When midazolam is administered in combination with fentanyl, the incidence of hypoxemia or apnea becomes more likely. Although the incidence of respiratory depression/arrest is low (0.1–0.5%) when midazolam is administered alone at normal doses, the concomitant use with CNS acting drugs, mainly analgesic opiates, may increase the possibility of hypotension, respiratory depression, respiratory arrest, and death, even at therapeutic doses. Potential drug interactions involving at least one CNS depressant were observed for 84% of midazolam users who were subsequently required to receive the benzodiazepine antagonist flumazenil. Therefore, efforts directed toward monitoring drug interactions and preventing injuries from midazolam administration are expected to have a substantial impact on the safe use of this drug. Midazolam, when taken during the third trimester of pregnancy, may cause risk to the neonate, including benzodiazepine withdrawal syndrome, with possible symptoms including hypotonia, apnoeic spells, cyanosis, and impaired metabolic responses to cold stress. Symptoms of hypotonia and the neonatal benzodiazepine withdrawal syndrome have been reported to persist from hours to months after birth. Other neonatal withdrawal symptoms include hyperexcitability, tremor, and gastrointestinal upset (diarrhea or vomiting). Breastfeeding by mothers using midazolam is not recommended. Additional caution is required in the elderly, as they are more sensitive to the pharmacological effects of benzodiazepines, metabolise them more slowly, and are more prone to adverse effects, including drowsiness, amnesia (especially anterograde amnesia), ataxia, hangover effects, confusion, and falls. A benzodiazepine dependence occurs in about one-third of individuals who are treated with benzodiazepines for longer than 4 weeks, which typically results in tolerance and benzodiazepine withdrawal syndrome when the dose is reduced too rapidly. Midazolam infusions may induce tolerance and a withdrawal syndrome in a matter of days. The risk factors for dependence include dependent personality, use of a benzodiazepine that is short-acting, high potency and long-term use of benzodiazepines. Withdrawal symptoms from midazolam can range from insomnia and anxiety to seizures and psychosis. Withdrawal symptoms can sometimes resemble a person’s underlying condition. Gradual reduction of midazolam after regular use can minimise withdrawal and rebound effects. Tolerance and the resultant withdrawal syndrome may be due to receptor down-regulation and GABAA receptor alterations in gene expression, which causes long-term changes in the function of the GABAergic neuronal system. Chronic users of benzodiazepine medication who are given midazolam experience reduced therapeutic effects of midazolam, due to tolerance to benzodiazepines. Prolonged infusions with midazolam results in the development of tolerance; if midazolam is given for a few days or more a withdrawal syndrome can occur. Therefore, preventing a withdrawal syndrome requires that a prolonged infusion be gradually withdrawn, and sometimes, continued tapering of dose with an oral long-acting benzodiazepine such as clorazepate dipotassium. When signs of tolerance to midazolam occur during intensive care unit sedation the addition of an opioid or propofol is recommended. Withdrawal symptoms can include irritability, abnormal reflexes, tremors, clonus, hypertonicity, delirium and seizures, nausea, vomiting, diarrhea, tachycardia, hypertension, and tachypnea. In those with significant dependence, sudden discontinuation may result in withdrawal symptoms such as status epilepticus that may be fatal. A midazolam overdose is considered a medical emergency and generally requires the immediate attention of medical personnel. Benzodiazepine overdose in healthy individuals is rarely life-threatening with proper medical support; however, the toxicity of benzodiazepines increases when they are combined with other CNS depressants such as alcohol, opioids, or tricyclic antidepressants. The toxicity of benzodiazepine overdose and risk of death is also increased in the elderly and those with obstructive pulmonary disease or when used intravenously. Treatment is supportive; activated charcoal can be used within an hour of the overdose. The antidote for an overdose of midazolam (or any other benzodiazepine) is flumazenil. While effective in reversing the effects of benzodiazepines it is not used in most cases as it may trigger seizures in mixed overdoses and benzodiazepine dependent individuals. Concentrations of midazolam or its major metabolite, 1-hydroxymidazolam glucuronide, may be measured in plasma, serum, or whole blood to monitor for safety in those receiving the drug therapeutically, to confirm a diagnosis of poisoning in hospitalized patients, or to assist in a forensic investigation of a case of fatal overdosage. Patients with renal dysfunction may exhibit prolongation of elimination half-life for both the parent drug and its active metabolite, with accumulation of these two substances in the bloodstream and the appearance of adverse depressant effects. Protease inhibitors, nefazodone, sertraline, grapefruit, fluoxetine, erythromycin, diltiazem, clarithromycin inhibit the metabolism of midazolam, leading to a prolonged action. St John’s wort, rifapentine, rifampin, rifabutin, phenytoin enhance the metabolism of midazolam leading to a reduced action. Sedating antidepressants, antiepileptic drugs such as phenobarbital, phenytoin and carbamazepine, sedative antihistamines, opioids, antipsychotics and alcohol enhance the sedative effects of midazolam. Midazolam is metabolized almost completely by cytochrome P450-3A4. Atorvastatin administration along with midazolam results in a reduced elimination rate of midazolam. St John’s wort decreases the blood levels of midazolam. Grapefruit juice reduces intestinal 3A4 and results in less metabolism and higher plasma concentrations. Midazolam is a short-acting benzodiazepine in adults with an elimination half-life of 1.5-2.5 hours. In the elderly, as well as young children and adolescents, the elimination half-life is longer. Midazolam is metabolised into an active metabolite alpha1-hydroxymidazolam. Age-related deficits, renal and liver status affect the pharmacokinetic factors of midazolam as well as its active metabolite. However, the active metabolite of midazolam is minor and contributes to only 10 percent of biological activity of midazolam. Midazolam is poorly absorbed orally, with only 50 percent of the drug reaching the bloodstream. Midazolam is metabolised by cytochrome P450 (CYP) enzymes and by glucuronide conjugation. The therapeutic as well as adverse effects of midazolam are due to its effects on the GABAA receptors; midazolam does not activate GABAA receptors directly but, as with other benzodiazepines, it enhances the effect of the neurotransmitter GABA on the GABAA receptors (↑ frequency of Cl− channel opening) resulting in neural inhibition. Almost all of the properties can be explained by the actions of benzodiazepines on GABAA receptors. This results in the following pharmacological properties being produced: sedation, induction of sleep, reduction in anxiety, anterograde amnesia, muscle relaxation and anticonvulsant effects. 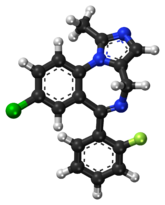 Midazolam is among about 35 benzodiazepines currently used medically, and was synthesized in 1975 by Walser and Fryer at Hoffmann-LaRoche, Inc in the United States. Owing to its water solubility, it was found to be less likely to cause thrombophlebitis than similar drugs. The anticonvulsant properties of midazolam were studied in the late 1970s, but not until the 1990s did it emerge as an effective treatment for convulsive status epilepticus. As of 2010[update], it is the most commonly used benzodiazepine in anesthetic medicine. In acute medicine, midazolam has become more popular than other benzodiazepines, such as lorazepam and diazepam, because it is shorter lasting, is more potent, and causes less pain at the injection site. Midazolam is also becoming increasingly popular in veterinary medicine due to its water solubility. In 2018 it was revealed the CIA considered using Midazolam as a “truth serum” on terrorist suspects in project “Medication”. Midazolam is available as a generic medication and is not very expensive. The wholesale price of a vial is about US$0.35. Midazolam is available in the United States as a syrup or as an injectable solution. Dormicum brand midazolam is marketed by Roche as white, oval, 7.5-mg tablets in boxes of two or three blister strips of 10 tablets, and as blue, oval, 15-mg tablets in boxes of two (Dormonid 3x) blister strips of 10 tablets. The tablets are imprinted with “Roche” on one side and the dose of the tablet on the other side. Dormicum is also available as 1-, 3-, and 10-ml ampoules at a concentration of 5 mg/ml. Another manufacturer, Novell Pharmaceutical Laboratories, makes it available as Miloz in 3- and 5-ml ampoules. Midazolam is the only water-soluble benzodiazepine available. Another maker is Roxane Laboratories; the product in an oral solution, Midazolam HCl Syrup, 2 mg/ml clear, in a red to purplish-red syrup, cherry in flavor. It becomes soluble when the injectable solution is buffered to a pH of 2.9–3.7. Midazolam is also available in liquid form. It can be administered intramuscularly, intravenously, intrathecally, intranasally, buccally, or orally. In the Netherlands, midazolam is a List II drug of the Opium Law. Midazolam is a Schedule IV drug under the Convention on Psychotropic Substances. In the United Kingdom, midazolam is a Schedule 3/Class C controlled drug. In the United States, midazolam (DEA number 2884) is on the Schedule IV list of the Controlled Substances Act as a non-narcotic agent with low potential for abuse. In 2011, the European Medicines Agency granted a marketing authorisation for a buccal application form of midazolam, sold under the trade name Buccolam. Buccolam was approved for the treatment of prolonged, acute, convulsive seizures in people from three months to less than 18 years of age. This was the first application of a paediatric-use marketing authorisation. The drug has been introduced for use in executions by lethal injection in certain jurisdictions in the United States in combination with other drugs. It was introduced to replace pentobarbital after the latter’s manufacturer disallowed that drug’s use for executions. Midazolam has been used as part of a three-drug cocktail, with vecuronium bromide and potassium chloride in Florida and Oklahoma prisons. Midazolam has also been used along with hydromorphone in a two-drug protocol in Ohio and Arizona. Ohio used midazolam in the execution of Dennis McGuire in January 2014; it took McGuire 24 minutes to die after the procedure started, and he gasped and appeared to be choking during that time, leading to questions about the dosing and timing of the drug administration, as well as the choice of drugs. In October 2016, the U.S. state of Ohio announced that it would resume executions in January 2017, using the midazolam-vecuronium bromide-potassium chloride cocktail, but this was blocked by a Federal judge. On 25 July 2017, Ronald Phillips was executed with a three-drug cocktail including midazolam after the Supreme Court refused to grant a stay. Prior to this, the last execution in Ohio had been that of Dennis McGuire. Murderer Gary Otte‘s lawyers unsuccessfully challenged his Ohio execution, arguing that midazolam might not protect him from serious pain when the other drugs are administered. He died without incident in about 14 minutes on September 13, 2017. The State of Nevada is also known to use midazolam in execution procedures. In July 2018, one of the manufacturers accused state officials of obtaining the medication under false pretenses. This resulted in the first time a drug company successfully, though temporarily, halted an execution. A previous attempt in 2017 to halt an execution in the state of Arizona by another drug manufacturer was not successful. Midazolam acts as a sedative to render the condemned prisoner unconscious, at which time the vecuronium bromide and potassium chloride are administered, stopping the prisoner’s breathing and heart, respectively. Florida used midazolam to execute William Happ in October 2013. The usage of midazolam in executions has become controversial after condemned inmate Clayton Lockett apparently regained consciousness and started speaking midway through his execution when the state of Oklahoma attempted to execute him with an untested three-drug lethal injection cocktail using 100 mg of midazolam. Prison officials reportedly discussed taking him to a hospital before he was pronounced dead of a heart attack 40 minutes after the execution began. An observing doctor stated that Lockett’s vein had ruptured. It is not clear which drug or drugs caused his death or what quantities of vecuronium bromide and potassium chloride were released before the execution was cancelled. In Glossip v. Gross, attorneys for three Oklahoma inmates argued that midazolam could not achieve the level of unconsciousness required for surgery, meaning severe pain and suffering was likely. They argued that midazolam was cruel and unusual punishment and thus contrary to the Eighth Amendment to the United States Constitution. In June 2015, the U.S. Supreme Court ruled they failed to prove that midazolam was cruel and unusual when compared to known, available alternatives. again putting the effectiveness of the drug in question. On April 24, 2017, Arkansas carried out a double-execution of Jack Jones, 52, and Marcel Williams, 46. The state of Arkansas attempted to execute eight people before its supply of midazolam expired on April 30, 2017. Two of them were granted a stay of execution, and another, Ledell T. Lee, 51, was executed on April 20, 2017. ^ Heizmann P, Eckert M, Ziegler WH (2012). “Pharmacokinetics and bioavailability of midazolam in man”. British Journal of Clinical Pharmacology. 16 Suppl 1: 43S–49S. doi:10.1111/j.1365-2125.1983.tb02270.x. PMC 1428091. PMID 6138080. ^ Johnson TN, Rostami-Hodjegan A, Goddard JM, Tanner MS, Tucker GT (September 2002). “Contribution of midazolam and its 1-hydroxy metabolite to preoperative sedation in children: a pharmacokinetic-pharmacodynamic analysis” (PDF). British Journal of Anaesthesia. 89 (3): 428–37. doi:10.1093/bja/aef213. PMID 12402721. ^ a b c d e f g h i j “Midazolam Hydrochloride”. The American Society of Health-System Pharmacists. Archived from the original on 2015-09-05. Retrieved Aug 1, 2015. ^ a b “Midazolam Injection” (PDF). Medsafe. New Zealand Ministry of Health. 2012-10-26. Archived from the original (PDF) on 2016-02-22. Retrieved 2016-04-06. ^ a b Brigo F, Nardone R, Tezzon F, Trinka E (August 2015). “Nonintravenous midazolam versus intravenous or rectal diazepam for the treatment of early status epilepticus: A systematic review with meta-analysis”. Epilepsy & Behavior. 49: 325–36. doi:10.1016/j.yebeh.2015.02.030. PMID 25817929. ^ a b c d e f g h i j k l m n Riss J, Cloyd J, Gates J, Collins S (August 2008). “Benzodiazepines in epilepsy: pharmacology and pharmacokinetics”. Acta Neurologica Scandinavica. 118 (2): 69–86. doi:10.1111/j.1600-0404.2008.01004.x. PMID 18384456. ^ a b c Hamilton R (2015). Tarascon Pocket Pharmacopoeia 2015 Deluxe Lab-Coat Edition. Jones & Bartlett Learning. p. 21. ISBN 9781284057560. ^ “Midazolam use while Breastfeeding”. Archived from the original on 5 September 2015. Retrieved 29 August 2015. ^ Fischer, Jnos; Ganellin, C. Robin (2006). Analogue-based Drug Discovery. John Wiley & Sons. p. 539. ISBN 9783527607495. ^ a b “Midazolam”. International Drug Price Indicator Guide. Retrieved 29 August 2015. ^ Isojärvi JI, Tokola RA (December 1998). “Benzodiazepines in the treatment of epilepsy in people with intellectual disability”. Journal of Intellectual Disability Research. 42 Suppl 1 (1): 80–92. PMID 10030438. ^ McTague, Amy; Martland, Timothy; Appleton, Richard (10 January 2018). “Drug management for acute tonic-clonic convulsions including convulsive status epilepticus in children”. The Cochrane Database of Systematic Reviews. 1: CD001905. doi:10.1002/14651858.CD001905.pub3. ISSN 1469-493X. PMID 29320603. ^ a b c Walker M (September 2005). “Status epilepticus: an evidence based guide”. BMJ. 331 (7518): 673–7. doi:10.1136/bmj.331.7518.673. PMC 1226249. PMID 16179702. ^ Murthy JM (December 2006). “Refractory status epilepticus”. Neurology India. 54 (4): 354–8. doi:10.4103/0028-3886.28104. PMID 17114841. ^ Eriksson K, Kälviäinen R (November 2005). “Pharmacologic management of convulsive status epilepticus in childhood”. Expert Review of Neurotherapeutics. 5 (6): 777–83. doi:10.1586/14737175.5.6.777. PMID 16274335. ^ a b Wolfe TR, Macfarlane TC (May 2006). “Intranasal midazolam therapy for pediatric status epilepticus”. The American Journal of Emergency Medicine. 24 (3): 343–6. doi:10.1016/j.ajem.2005.11.004. PMID 16635708. ^ Sofou K, Kristjánsdóttir R, Papachatzakis NE, Ahmadzadeh A, Uvebrant P (August 2009). “Management of prolonged seizures and status epilepticus in childhood: a systematic review”. Journal of Child Neurology. 24 (8): 918–26. doi:10.1177/0883073809332768. PMID 19332572. ^ Brown TB, Lovato LM, Parker D (January 2005). “Procedural sedation in the acute care setting”. American Family Physician. 71 (1): 85–90. PMID 15663030. ^ O’Connor M, Bucknall T, Manias E (May 2010). “Sedation management in Australian and New Zealand intensive care units: doctors’ and nurses’ practices and opinions”. American Journal of Critical Care. 19 (3): 285–95. doi:10.4037/ajcc2009541. PMID 19770414. ^ McQuaid KR, Laine L (May 2008). “A systematic review and meta-analysis of randomized, controlled trials of moderate sedation for routine endoscopic procedures”. Gastrointestinal Endoscopy. 67 (6): 910–23. doi:10.1016/j.gie.2007.12.046. PMID 18440381. ^ Arcangeli A, Antonelli M, Mignani V, Sandroni C (November 2005). “Sedation in PACU: the role of benzodiazepines”. Current Drug Targets. 6 (7): 745–8. doi:10.2174/138945005774574416. PMID 16305452. ^ De Cosmo G, Congedo E, Clemente A, Aceto P (November 2005). “Sedation in PACU: the role of propofol”. Current Drug Targets. 6 (7): 741–4. doi:10.2174/138945005774574425. PMID 16305451. ^ Rawicz M (Oct–Dec 2008). “[Recommendations for analgesia and sedation in neonatal intensive care]”. Medycyna Wieku Rozwojowego. 12 (4 Pt 1): 958–67. PMID 19471072. ^ Bellù R, de Waal KA, Zanini R (January 2008). Bellù R (ed.). “Opioids for neonates receiving mechanical ventilation”. The Cochrane Database of Systematic Reviews (1): CD004212. doi:10.1002/14651858.CD004212.pub3. PMID 18254040. ^ Huf, G; Alexander, J; Gandhi, P; Allen, MH (25 November 2016). “Haloperidol plus promethazine for psychosis-induced aggression”. The Cochrane Database of Systematic Reviews. 11: CD005146. doi:10.1002/14651858.CD005146.pub3. PMID 27885664. ^ Liverpool Care Pathway (January 2005). “Care of the Dying Pathway (lcp) (Hospital)” (PDF). United Kingdom. Archived from the original (PDF) on 2011-10-08. ^ de Graeff A, Dean M (February 2007). “Palliative sedation therapy in the last weeks of life: a literature review and recommendations for standards”. Journal of Palliative Medicine. 10 (1): 67–85. doi:10.1089/jpm.2006.0139. PMID 17298256. ^ Cox CE, Reed SD, Govert JA, Rodgers JE, Campbell-Bright S, Kress JP, Carson SS (March 2008). “Economic evaluation of propofol and lorazepam for critically ill patients undergoing mechanical ventilation”. Critical Care Medicine. 36 (3): 706–14. doi:10.1097/CCM.0B013E3181544248. PMC 2763279. PMID 18176312. ^ a b c d Olkkola KT, Ahonen J (2008). “Midazolam and other benzodiazepines”. Modern Anesthetics. Handbook of Experimental Pharmacology. 182. pp. 335–60. doi:10.1007/978-3-540-74806-9_16. ISBN 978-3-540-72813-9. PMID 18175099. ^ Verbeeck RK (December 2008). “Pharmacokinetics and dosage adjustment in patients with hepatic dysfunction”. European Journal of Clinical Pharmacology. 64 (12): 1147–61. doi:10.1007/s00228-008-0553-z. PMID 18762933. ^ Merritt P, Hirshman E, Hsu J, Berrigan M (January 2005). “Metamemory without the memory: are people aware of midazolam-induced amnesia?”. Psychopharmacology. 177 (3): 336–43. doi:10.1007/s00213-004-1958-8. PMID 15290003. ^ Vermeeren A (2004). “Residual effects of hypnotics: epidemiology and clinical implications”. CNS Drugs. 18 (5): 297–328. doi:10.2165/00023210-200418050-00003. PMID 15089115. ^ a b c Mencía SB, López-Herce JC, Freddi N (May 2007). “Analgesia and sedation in children: practical approach for the most frequent situations”. Jornal de Pediatria. 83 (2 Suppl): S71–82. doi:10.2223/JPED.1625. PMID 17530139. Archived from the original on 2011-10-04. ^ Mancuso CE, Tanzi MG, Gabay M (September 2004). “Paradoxical reactions to benzodiazepines: literature review and treatment options”. Pharmacotherapy. 24 (9): 1177–85. doi:10.1592/phco.24.13.1177.38089. PMID 15460178. Archived from the original on 2011-06-06. ^ Reves JG, Fragen RJ, Vinik HR, Greenblatt DJ (March 1985). “Midazolam: pharmacology and uses”. Anesthesiology. 62 (3): 310–24. doi:10.1097/00000542-198503000-00017. PMID 3156545. Archived from the original on 2012-10-01. ^ a b Bailey PL, Pace NL, Ashburn MA, Moll JW, East KA, Stanley TH (November 1990). “Frequent hypoxemia and apnea after sedation with midazolam and fentanyl”. Anesthesiology. 73 (5): 826–30. doi:10.1097/00000542-199011000-00005. PMID 2122773. ^ a b Classen DC, Pestotnik SL, Evans RS, Burke JP (1992). “Intensive surveillance of midazolam use in hospitalized patients and the occurrence of cardiorespiratory arrest”. Pharmacotherapy. 12 (3): 213–6. doi:10.1002/j.1875-9114.1992.tb04512.x (inactive 2019-03-15). PMID 1608855. ^ Wright SW, Chudnofsky CR, Dronen SC, Wright MB, Borron SW (March 1990). “Midazolam use in the emergency department”. The American Journal of Emergency Medicine. 8 (2): 97–100. doi:10.1016/0735-6757(90)90192-3. PMID 2302291. ^ Yaster M, Nichols DG, Deshpande JK, Wetzel RC (September 1990). “Midazolam-fentanyl intravenous sedation in children: case report of respiratory arrest”. Pediatrics. 86 (3): 463–7. PMID 2388795. ^ West JM, Estrada S, Heerdt M (July 1987). “Sudden hypotension associated with midazolam and sufentanil”. Anesthesia and Analgesia. 66 (7): 693–4. doi:10.1213/00000539-198707000-00026. PMID 2955719. ^ a b Kawano DF, Ueta J, Sankarankutty AK, Pereira LR, de Freitas O (June 2009). “Midazolam-related drug interactions: detection of risk situations to the patient safety in a brazilian teaching hospital”. Journal of Patient Safety. 5 (2): 69–74. doi:10.1097/PTS.0b013e3181a5dafa. PMID 19920444. ^ McElhatton PR (Nov–Dec 1994). “The effects of benzodiazepine use during pregnancy and lactation”. Reproductive Toxicology. 8 (6): 461–75. doi:10.1016/0890-6238(94)90029-9. PMID 7881198. ^ Serreau R (April 2010). “[Drugs during preeclampsia. Fetal risks and pharmacology]”. Annales Françaises d’Anesthésie et de Réanimation. 29 (4): e37–46. doi:10.1016/j.annfar.2010.02.016. PMID 20347563. ^ Fukuda K, Shoda T, Mima H, Uga H (August 2002). “Midazolam induces expression of c-Fos and EGR-1 by a non-GABAergic mechanism”. Anesthesia and Analgesia. 95 (2): 373–8, table of contents. doi:10.1097/00000539-200208000-00024. PMID 12145054. ^ Cho HH, O’Connell JP, Cooney MF, Inchiosa MA (2007). “Minimizing tolerance and withdrawal to prolonged pediatric sedation: case report and review of the literature”. Journal of Intensive Care Medicine. 22 (3): 173–179. doi:10.1177/0885066607299556. PMID 17569173. ^ Potokar J, Coupland N, Wilson S, Rich A, Nutt D (September 1999). “Assessment of GABA(A)benzodiazepine receptor (GBzR) sensitivity in patients on benzodiazepines”. Psychopharmacology. 146 (2): 180–4. doi:10.1007/s002130051104. PMID 10525753. Archived from the original on 2002-01-12. ^ a b A Boon N, Davidson S, R Colledge N, Walker B, Hunter JG (2006). Davidson’s principles practice of medicine. Edinburgh: Elsevier/Churchill Livingstone. pp. 212–213. ISBN 978-0-443-10057-4. ^ a b A Rastegar D, I Fingerhood M (2005). Addiction medicine: an evidence-based handbook. Philadelphia, PA: Lippincott Williams Wilkins. p. 80. ISBN 978-0-7817-6154-3. ^ Baselt RC (2008). Disposition of Toxic Drugs and Chemicals in Man (8th ed.). Foster City CA: Biomedical Publications. pp. 1037–40. ISBN 978-0-9626523-7-0. ^ Mc Donnell CG, Harte S, O’Driscoll J, O’Loughlin C, Van Pelt FN, Shorten GD, Van Pelt FD (September 2003). “The effects of concurrent atorvastatin therapy on the pharmacokinetics of intravenous midazolam”. Anaesthesia. 58 (9): 899–904. doi:10.1046/j.1365-2044.2003.03339.x. PMID 12911366. ^ Hu Z, Yang X, Ho PC, Chan SY, Heng PW, Chan E, Duan W, Koh HL, Zhou S (2005). “Herb-drug interactions: a literature review”. Drugs. 65 (9): 1239–82. doi:10.2165/00003495-200565090-00005. PMID 15916450. ^ Arayne MS, Sultana N, Bibi Z (October 2005). “Grape fruit juice-drug interactions”. Pakistan Journal of Pharmaceutical Sciences. 18 (4): 45–57. PMID 16380358. ^ Barash PG, Cullen BF, Stoelting RK, Cahalan MD (1 April 2009). Clinical Anesthesia (6 ed.). Lippincott Williams Wilkins. p. 588. ISBN 978-0-7817-8763-5. Archived from the original on 20 February 2017. ^ Spina SP, Ensom MH (March 2007). “Clinical pharmacokinetic monitoring of midazolam in critically ill patients”. Pharmacotherapy. 27 (3): 389–98. doi:10.1592/phco.27.3.389. PMID 17316150. ^ a b Udaykumar, Padmaja (30 May 2008). Short Textbook of Pharmacology for Dental and Allied Health Sciences. Jaypee Brothers Medical Publishers. p. 128. ISBN 978-81-8448-149-5. ^ Armin Walser, Rodney I. Fryer, Louis Benjamin. Imidazo[1,5-.alpha.][1,4]benzodiazepines. US Patent 4166185, issued to Hoffmann-LaRoche Aug 28, 1979. ^ Kaplan JH, Reich DL, Lake CL, Konstadt SN (15 May 2006). Cardiac Anesthesia (5 ed.). W.B. Saunders Company. ISBN 978-1-4160-0253-6. ^ Malamed SF (16 October 2002). Sedation: a guide to patient management. St. Louis: Mosby. p. 335. ISBN 978-0-323-01226-3. ^ S Wheeler D, R Wong H, P Shanley T (2007). Pediatric critical care medicine: basic science and clinical evidence. London: Springer. p. 984. ISBN 978-1-84628-463-2. Archived from the original on 2017-09-08. ^ Oparil S, Weber M (22 April 2005). Hypertension: a companion to Brenner and Rector’s the kidney (2 ed.). Philadelphia: Elsevier Mosby. p. 816. ISBN 978-0-7216-0258-5. ^ Riviere J, Papich MG (30 Mar 2009). Veterinary Pharmacology and Therapeutics. Wiley-Blackwell. p. 358. ISBN 978-0-8138-2061-3. Archived from the original on 2012-11-12. ^ “CIA considered potential truth serum for terror suspects after 9/11”. ^ FDA, ed. (2015). “Orange Book: Approved Drug Products; Midazolam”. Archived from the original on 17 August 2016. Retrieved 25 July 2015. ^ Steib A, Hausberger D, Robillart A, Roche A, Franckhauser D, Dupeyron JP (June 2006). “[Anaesthetic considerations for interventional radiology]”. Annales Françaises d’Anesthésie et de Réanimation. 25 (6): 615–25. doi:10.1016/j.annfar.2006.01.018. PMID 16632296. ^ Ho KM, Ismail H (May 2008). “Use of intrathecal midazolam to improve perioperative analgesia: a meta-analysis”. Anaesthesia and Intensive Care. 36 (3): 365–73. doi:10.1177/0310057X0803600307. PMID 18564797. ^ Beran RG (April 2008). “An alternative perspective on the management of status epilepticus”. Epilepsy & Behavior. 12 (3): 349–53. doi:10.1016/j.yebeh.2007.12.013. PMID 18262847. ^ International Narcotics Control Board (August 2003). “List of psychotropic substances under international control” (PDF). incb.org. Archived from the original (PDF) on 2012-08-31. Retrieved 2008-12-17. ^ Blackpool NHS Primary Care Trust (2007). “Medicines Management Update” (PDF). United Kingdom: National Health Service. Archived from the original (PDF) on 2010-12-04. ^ “US DEA Schedules”. Archived from the original on 2013-05-16. ^ “Monthly Report” (PDF). Committee for Medicinal Products for Human Use (CHMP). 5 July 2011. p. 1. Archived (PDF) from the original on 23 January 2012. ^ PR Newswire (6 September 2011). “ViroPharma’s Buccolam (Midazolam, Oromucosal Solution) Granted European Marketing Authorization for Treatment of Acute Seizures”. ^ a b Stefan Schulz (December 10, 2016). “Die fahrlässige Hinrichtung des Ronald Smith” (in German). der Spiegel. Archived from the original on December 10, 2016. Retrieved December 10, 2016. ^ a b “State by State Lethal Injection”. Death Penalty Information Center. Archived from the original on 2015-04-03. Retrieved 2015-04-10. ^ Ford D, Fantz A (2014-01-16). “Controversial execution in Ohio uses new drug combination”. CNN. Archived from the original on 2014-01-17. ^ Rebecca, Hersher (2017-01-26). “Federal Judge Blocks Ohio’s Lethal Injection Protocol”. NPR. Archived from the original on 2017-03-16. Retrieved 2017-03-15. ^ Blinder, Alan (2017-03-13). “When a Common Sedative Becomes an Execution Drug”. The New York Times. ISSN 0362-4331. Archived from the original on 2017-03-14. Retrieved 2017-03-15. ^ Ohio puts killer of 3-year-old to death in first execution in more than three years, July 25, 2017. ^ “Ohio to resume executions with new jab”. BBC News. 2016-10-03. Archived from the original on 2016-10-05. Retrieved 2016-10-03. ^ Sunday, Tom Porter On (6 January 2019). “Death row prisoner kills himself after execution halted”. Newsweek. Retrieved 6 January 2019. ^ Bowden, John (5 January 2019). “Nevada inmate on death row whose execution was delayed commits suicide: report”. TheHill. Retrieved 6 January 2019. ^ Watkins M (2013-10-15). “Happ executed using new drug”. The Gainesville Sun. Archived from the original on 2013-12-12. ^ Ekholm E (2014-04-29). 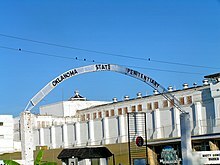 “One Execution Botched, Oklahoma Delays the Next – NYTimes.com”. The New York Times. Archived from the original on 2017-03-13. ^ Fretland, Katie (2014-04-30). “Oklahoma execution: Clayton Lockett writhes on gurney in botched procedure”. The Guardian. Archived from the original on 2014-04-30. ^ “US Supreme Court backs use of contentious execution drug”. BBC News. 29 June 2015. Archived from the original on 1 July 2015. Retrieved 2015-06-29. ^ Josh Sanburn (December 9, 2016). “The Drug Used in Alabama’s Problematic Execution Has a Controversial History”. Time Magazine. Archived from the original on December 9, 2016. Retrieved December 10, 2016. ^ Phil McCausland (April 21, 2017). “Arkansas Executes Ledell Lee, State’s First Inmate Put to Death Since 2005”. NBC. Archived from the original on April 28, 2017. Retrieved April 28, 2017.